Discussion in 'Pin Comparison' started by Nasubionna, Dec 26, 2017. Hi everyone! 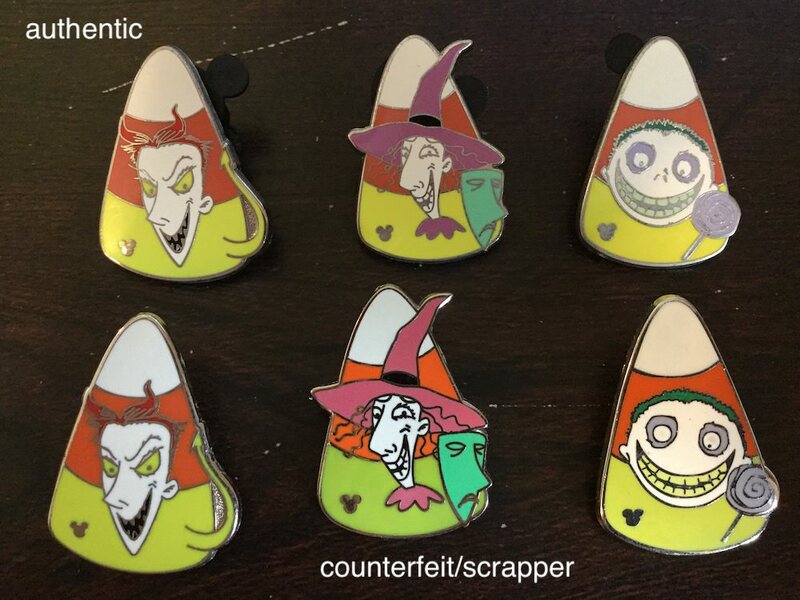 The 2010 Hidden Mickey pins featuring Nightmare Before Christmas characters are known to have fakes being pumped out from China, and I ended up with a fake set of Lock, Shock and Barrels courtesy of eBay. Lovely. But then I got my hands on some that are clearly authentic, so I thought I'd do a side-by-side comparison. I'm sorry I don't have Jack and Sally to compare as well. You can see VERY clear differences between Barrel - he's missing a pupil and his entire nose in the fake pin! And while Lock is pretty close between the two, Shock has a major color difference in her clothing and all three of the fakes have much thicker lines than the authentic pins. Here's the backs, though personally I struggle to identify any clear patterns/differences between the two. There is a clear difference in thickness and weight between the two sets. Anyway, I hope this was interesting and maybe helpful to some people! bookhugger and Ajk like this. At one point, weren't all the scrappers green candy corn instead of yellow? Oh wow, I don't know about that, but I suppose there actually is a more greenish tint to the scrappers yellow part compared to the real ones. It doesn't show up well in my pictures, but I can see it now that you're pointing it out! Thank you for the post... Always appreciate info on fakes. 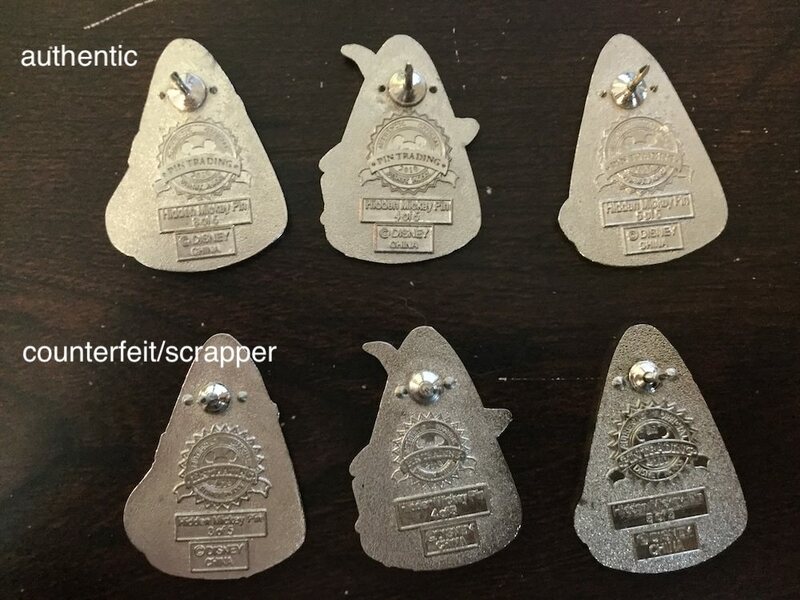 Regarding pin back differences: Is it lighting in the pics or is the DPT logo, the triangles in a circle frame, different? The circle frame on back of fakes look spikier/pointier to me.